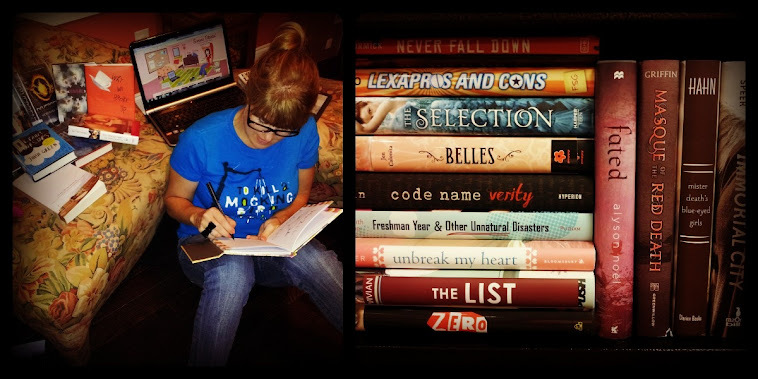 February is one of my favorite months being a school librarian, because it's all about the LOVE. 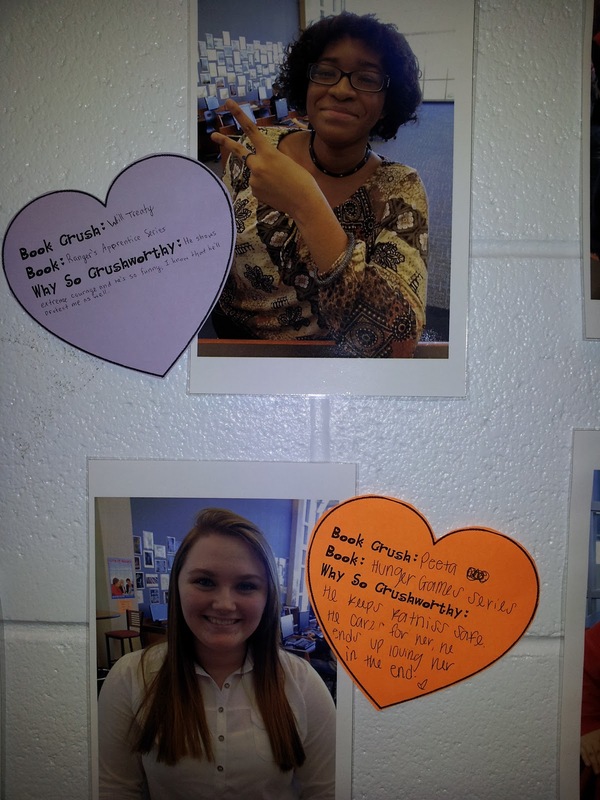 What better way to get teens pumped for Valentine's Day and all things romance than to get them to share their book crushes? When I was sixteen, I read S.E. Hinton's The Outsiders for the first time and fell hard for bad boy Dallas Winston (didn't hurt that I had Matt Dillon as a visual!). He may have been rude, crude and rough around the edges, but his loyalty to Johnny and Ponyboy ("Let's do it for Johnny!") and vulnerability in the presence of Cherry Valance made me want to rip him from the pages and save him from the Socs and his own self-destructive ways with my love. Why did Dallas Winston have to be a fictional character?!! And why did S.E. Hinton have to go and kill him?!!!!!! Dallas wasn't the first or last book boyfriend I'd lose to death. My most recent book boyfriend would have to be The Fault in Our Stars' Augustus Waters. C'mon, a boy who'd battled and overcome cancer, lost a leg to that cancer, but remained full of humor and hope to the point he'd fly thousands of miles overseas to make a dream come true for his terminal girlfriend Hazel? *sigh* *sniff* It's no wonder that Hazel loved you as she did, and when you died I sobbed for your family, Hazel and my heartbroken inner-teen self! I found an online candy hearts maker that allowed me to add the names of some of the more popular book crushes in recent series - Lola, Cricket, Bella, Jacob, Edward, Patch, Alex, Carlos, Luis (Fuentes brothers! *fans self*), Fang, Clary, Jace, Gale, Katniss, Peeta, Tris, Ron, Hermione, Harry, Augustus, Hazel, and Starfire (manga babe!). 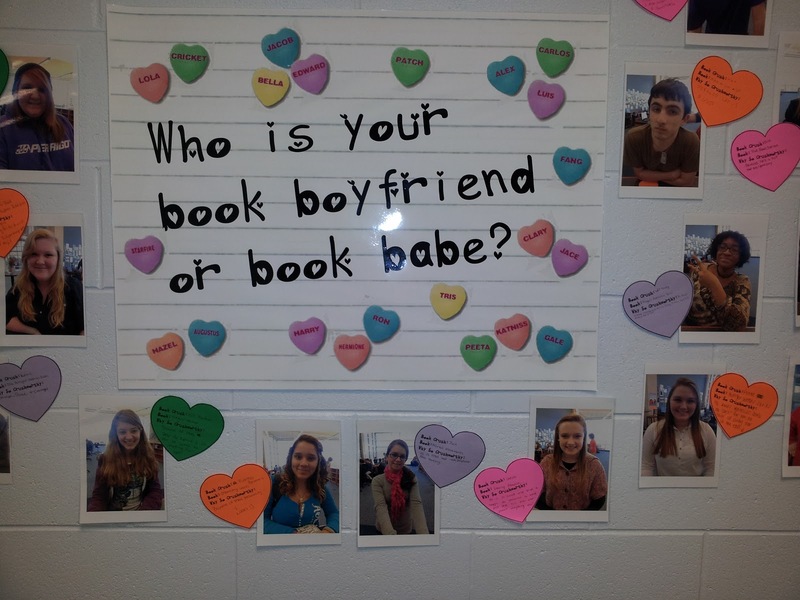 I have colorful cut-outs hearts that the students complete with info on their book boyfriend/babe, the name of the book, and why that character is so crushable. Snap a pic of the student, and we're good to go and swoon! ﻿So far, the Simone Elkeles' Fuentes brothers seem to be garnering the most love from the girls, while Katniss is rocking the guys' world. I only started the display this past week and hope to add many more hearts down the hallway as we get into February!